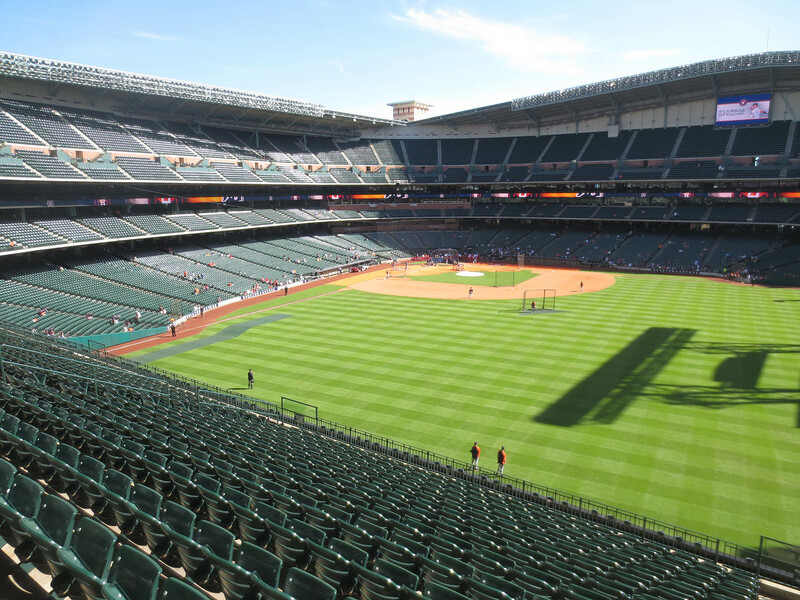 Step 1: Check out the Astros’ website to see how early the stadium opens. Step 2: Learn that it opens two hours early *only* on Saturdays. Step 3: Plan to be there on a Saturday and RUSH to get there on time. 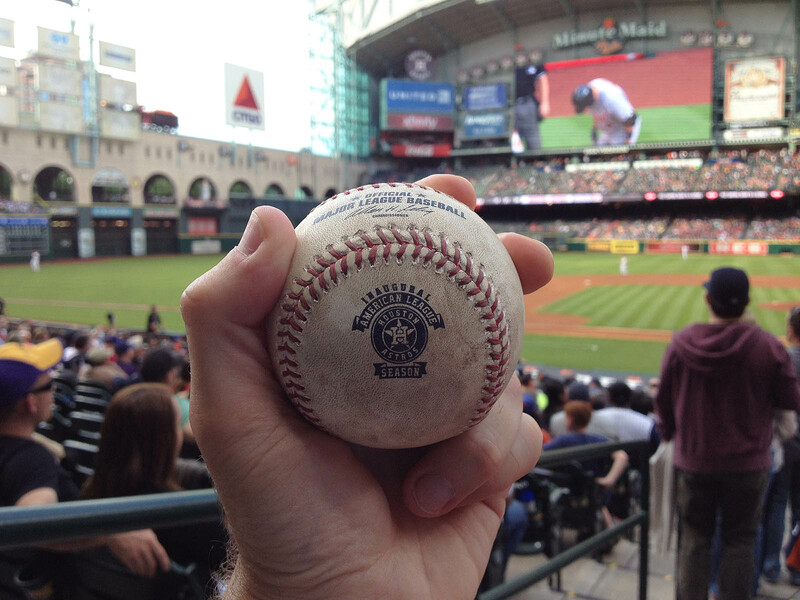 Step 4: Look forward to snagging an Astros commemorative ball during BP. Step 5: Hear that the website is wrong and that the gates open 90 minutes early. Step 6: Be very VERY annoyed and hope that the Astros never win another game. I caught the ricochet while cutting to my left through the 2nd row. Within a minute or two, Prince crushed a ball that appeared to be heading right toward the other guy. I could’ve easily drifted to my left and reached in front of him, but I don’t know . . . I felt like he deserved a chance to catch it. Therefore, as the ball was descending, I climbed back into the 2nd row in case he missed it. That’s exactly what happened. The ball sailed two feet over his head, and his two-inch vertical didn’t quite get the job done. 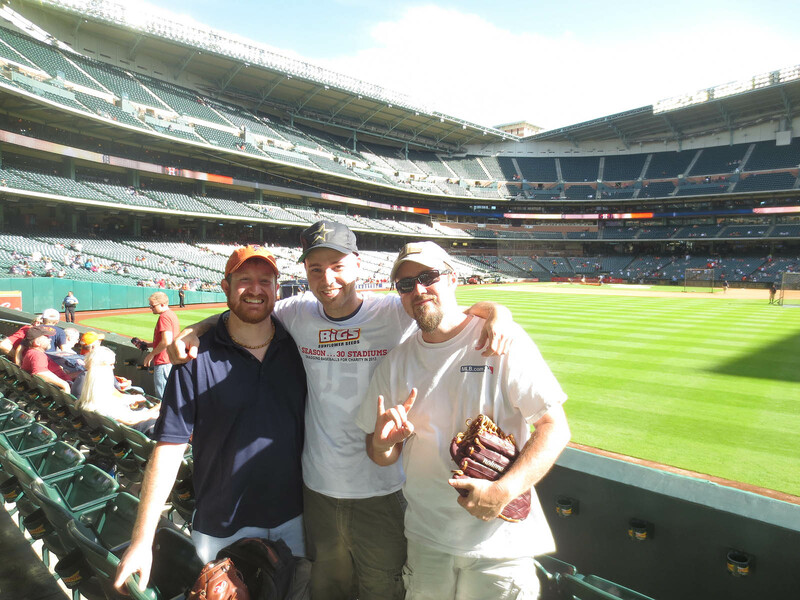 As the ball barely cleared his glove, this guy toppled over backward into a seat, and I made the catch. 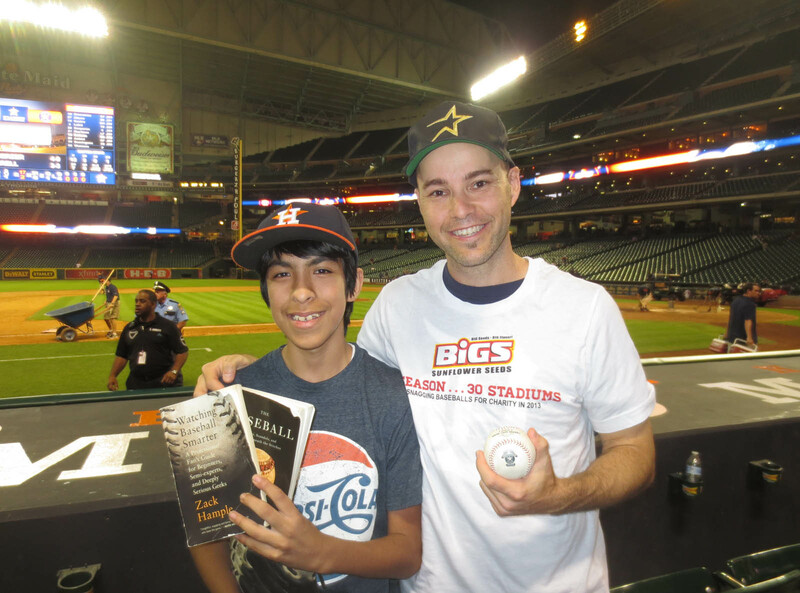 I snagged three more Prince Fielder home runs after that and tossed two of those balls to the kids. The first of the three landed near me in the seats and thankfully didn’t take a crazy bounce. The next home was a towering shot that I caught on the fly after climbing two or three rows up. Then I caught the final one after running 40 feet to my right through the front row, breaking a cup holder (which snapped off when my left knee grazed it), and reaching out over the railing. I could hear/sense that the whole stadium was buzzing — more for Prince’s power display, no doubt, but it was cool to be on the receiving end of it. 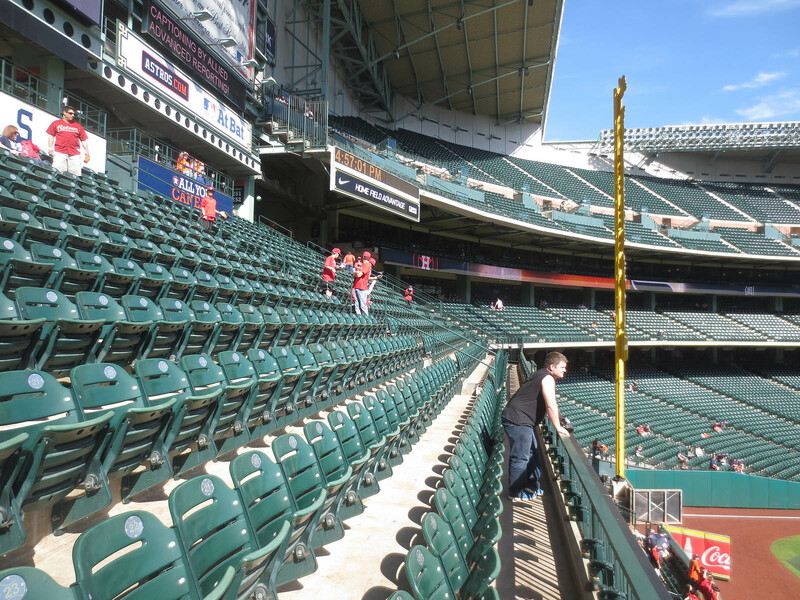 After that, I headed downstairs and stayed in right field. 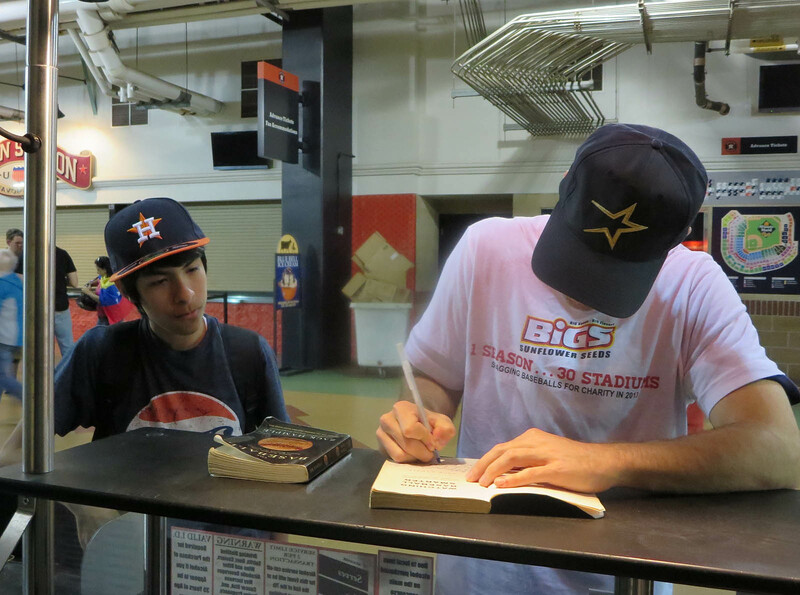 I didn’t snag any more baseballs for the rest of BP, but I signed a few for some kids that recognized me. In the photo above, the guy on the left is named Mike Miles, and I’ve known him for quite a while. Way back in 1997, my girlfriend (whom I ended up dating for four years) happened to be best friends with his girlfriend, so that’s how we met. He used to live right around the corner from me in New York City. Now he lives in Houston. The other guy in the photo is named Donny Haltom. He’s a local ballhawk, and I’ve known him for a few years. Did you see this tweet that I posted before the stadium had opened? That’s how she won the seeds. 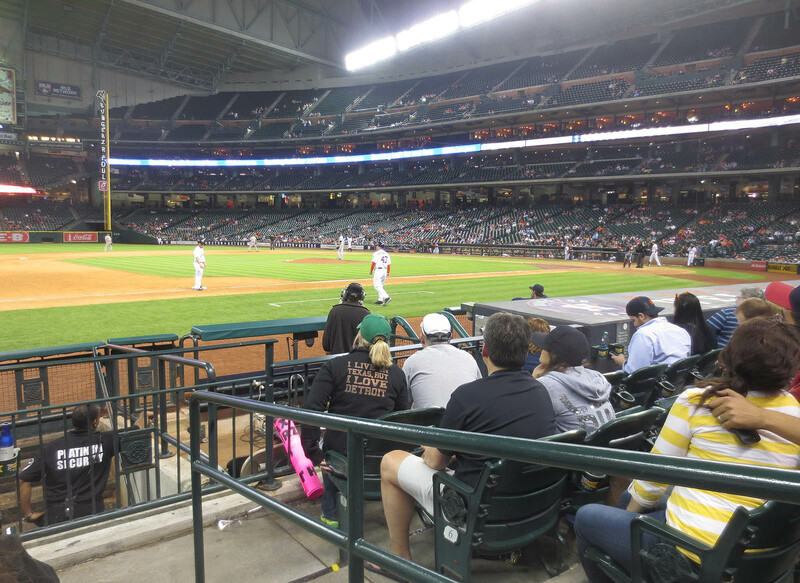 Given the fact that Max Scherzer was on the hill (and that the Astros are terrible), I figured there’d be lots of strikeouts, so I positioned myself near the home-plate end of the dugout. 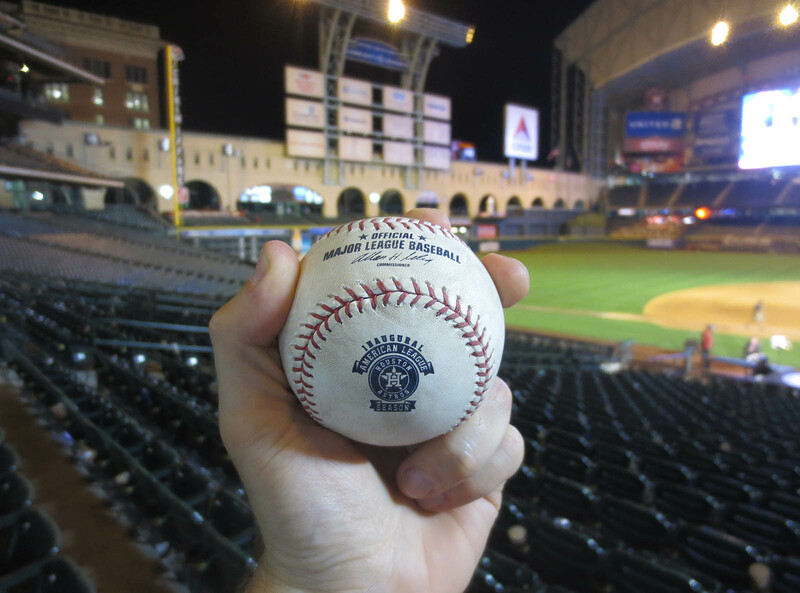 As the innings ticked by and my opportunities dwindled, I knew that my best shot at getting another commemorative ball would be from home plate umpire Scott Barry after the game. Before the bottom of the 9th got underway, I got the infield warm-up ball from Tigers coach Rafael Belliard, and although it *was* commemorative, the logo was quite worn — nice but not good enough. As far as I was concerned, I still had to get another. Angel and I had exchanged some emails over the past few seasons, but this was the first time that we actually met. It was great to catch up in person, and I also got to meet his father, whose name is . . . Angel. Nice guys — very polite and respectful. On my way up to the concourse, I took a closer look at the umpire ball . . .
. . . and was surprised to see a lumpy, uneven spot above the commemorative logo. See it there on the stitches, just left of center? That’s the kind of ball that I’m used to seeing in BP with the word “practice” stamped on the sweet spot. 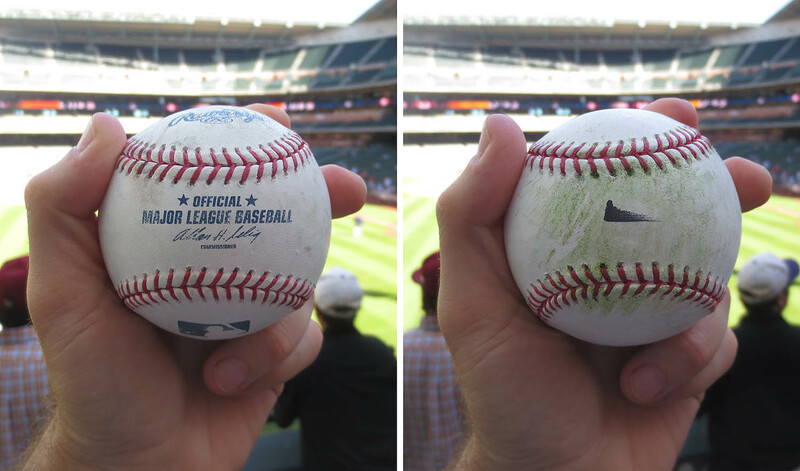 I wonder what the folks at MLB would say if they knew that a less-than-perfect ball nearly made it into a game. 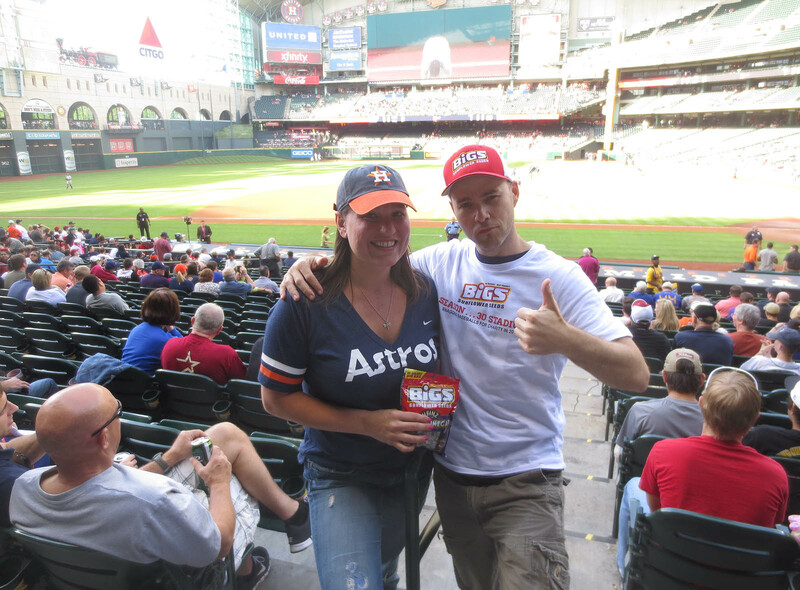 I was hoping to buy a new Astros cap on the way out — the one I have is waaay out of date — but by the time I finished, the team store was closed. No big deal. I’ll keep rockin’ the old cap. Maybe it’ll help me get future toss-ups. I mean, it shows that I’ve been a fan for a long time, right? 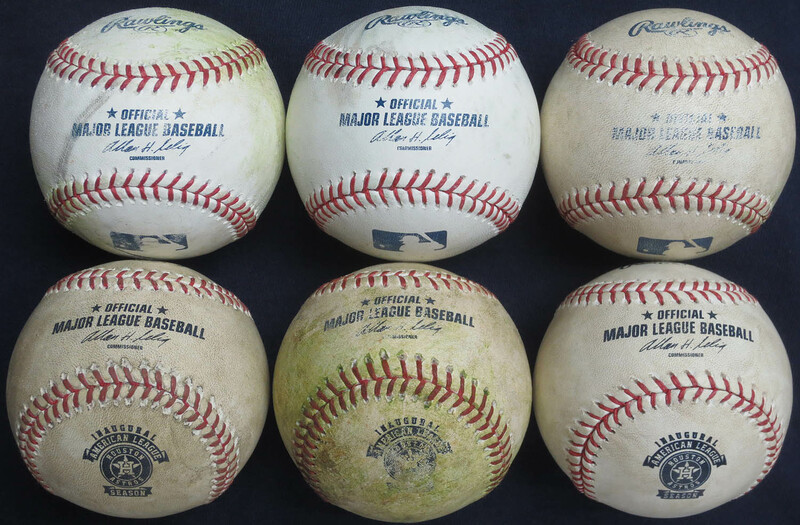 Back at my hotel (which I didn’t check into until midnight), I photographed the six baseballs that I kept . . .
. . . and stayed up way too late — as always. • 132 balls in 18 games this season = 7.33 balls per game. 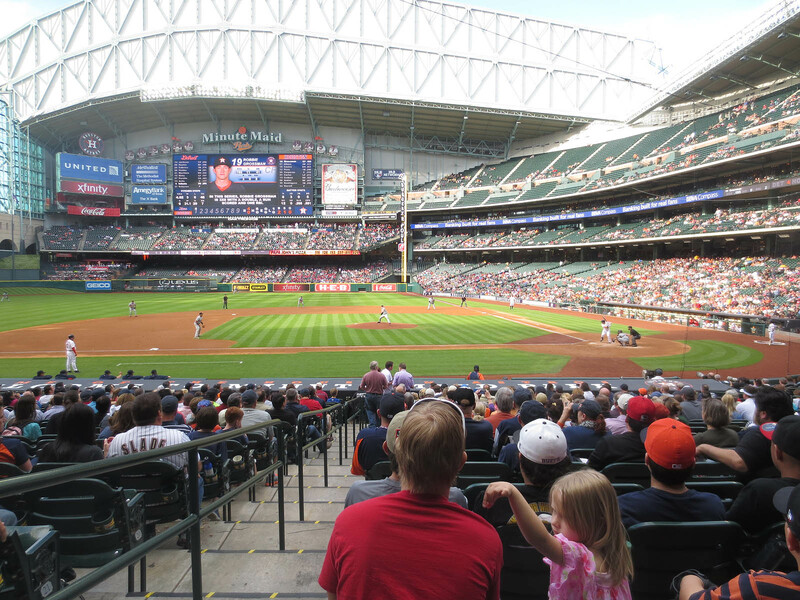 • 44 balls in 5 lifetime games at Minute Maid Park = 8.8 balls per game. Wow! 3 commemorative balls! Nice day Zack. Nice game Zack! I found out that another ballhawk was also at the Braves vs. Mets game on Sunday, and he too snagged a Rockies Commemorative Ball. Sounds like the Mets have got some leftover that they are using during B.P. That whistling sound is the sound of the baseball painted watermelon heading straight for you…. So if the Astros and Yankees play each other, Zack is now rooting for the ______? Wow! Nice commemorative logo! 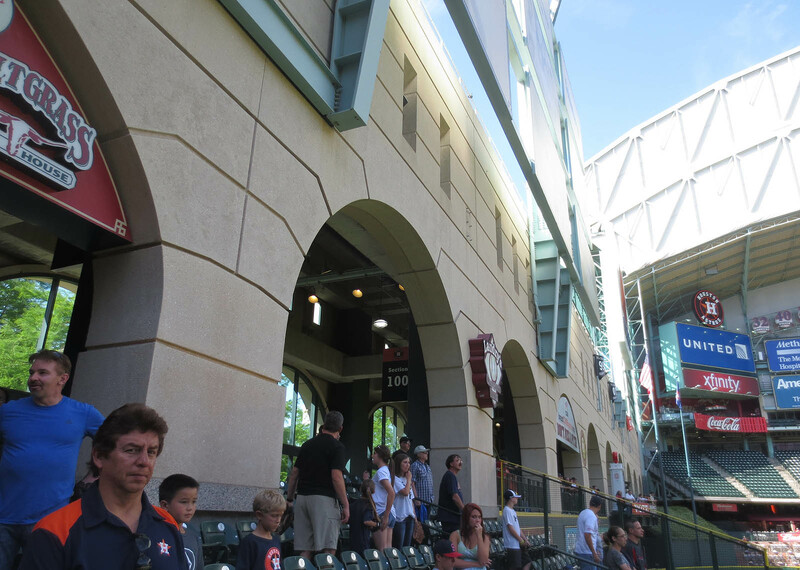 I saw the Astros in Anaheim this April and there wasn’t a commemorative to be found with them at that point. Zack, you need to change the number of donors and the amount pledged per ball. Cause I put my two cents in. The consecutive games with at least one ball streak continues to fascinate me! Great job; I love your work! 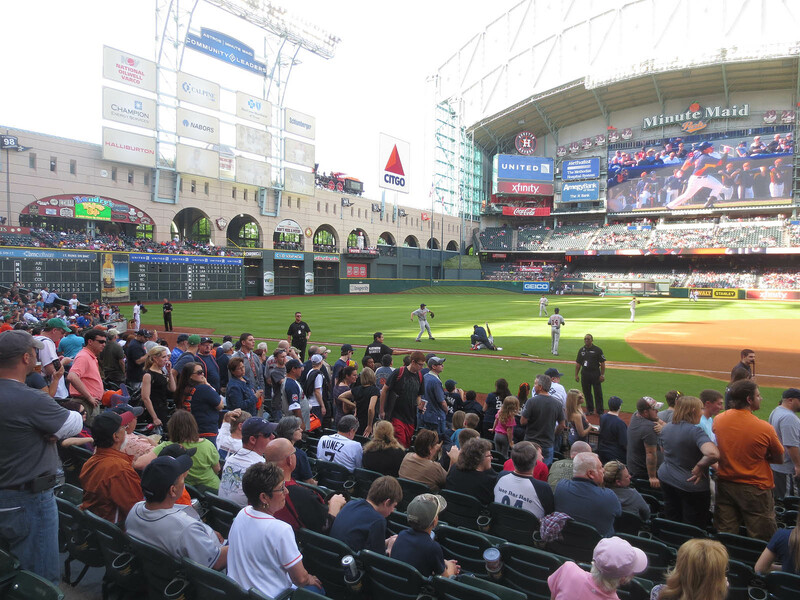 Do you have a calendar of which ballparks you will be in in the future? Would love to watch you “work”! Hey Zack! 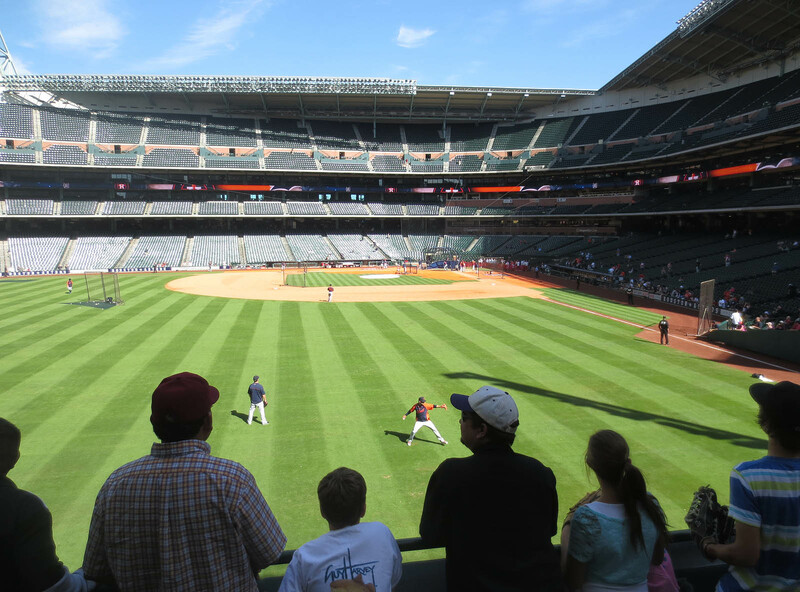 On my way to Camden right now…what time will you be arriving at the ballpark tomorrow? Cool. My time will come. If I have to wait ’til I visit Coors to snag one of those balls, so be it. Sorry I didn’t get to see you there, but PLEASE, don’t send that drummer after me! Cool. I hope you get some more. Don’t make me report you to the FAA. 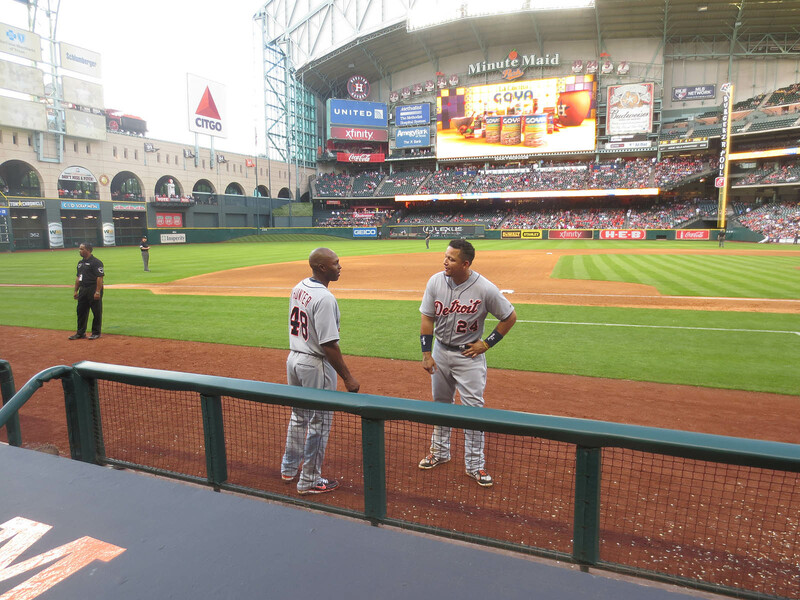 The Astros. When in doubt, I always root for the National League team. Oh wait. I’d say it’s a decent logo. It would’ve been great if “2013” were in there somewhere. I really hate it when commemorative balls don’t have the year. D’oh! I’ll update it in my next entry (which will almost certainly be posted tonight). Thanks for the pledge. Thank you. If I ever manage to catch up on my own blog, I’ll be sure to check out yours. Then scroll down and look for the calendar. I have a phone/radio interview scheduled tomorrow for 3:50pm, so I’m gonna try to get to the stadium by then and bang it out. There’s a chance, though, that I’ll still be in the car when I do it. Either way, I should be there fairly early. I plan to enter the stadium at the center-field end of the warehouse — you know, at the Eutaw Street gate. Refer to my tweet about how I felt about you getting the 3 commemoratives. I kid, though, congrats. 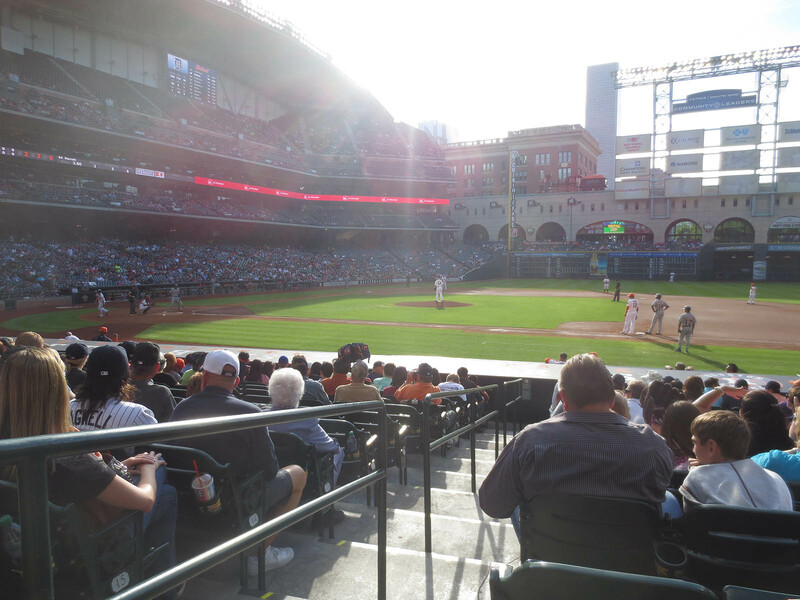 I hate how the Astros don’t take them on the road…. or take BP 3 days in a row on the road. Teams who are 8-22 usually I don’t know… need batting practice. Hey Zack it’s a nick Horowitz again, the 10 year old. Will u be at Met game Wednesday? I have 9th row seats in 114. You’re welcome to come to my seat at the game! 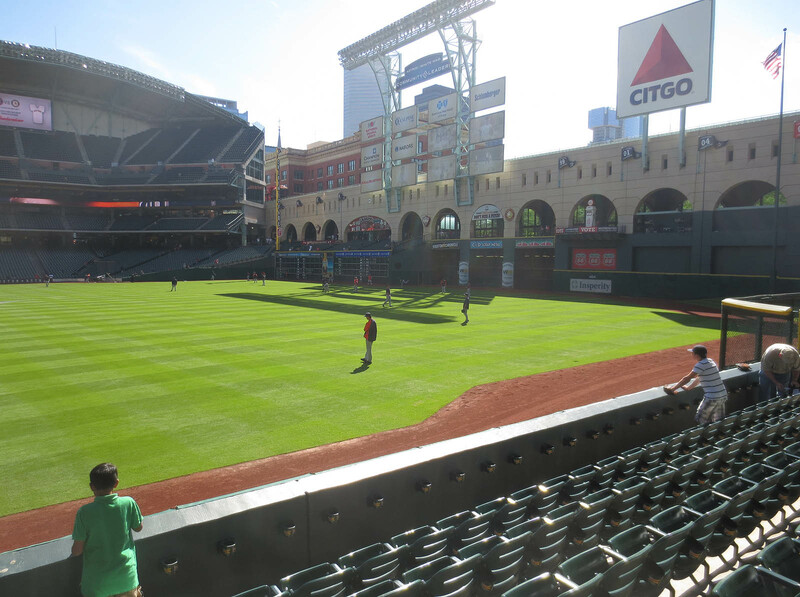 The Astros need to practice more than just hitting. I’d think you’d get more visiting team homers at PETCO. The Padres don’t seem to have much power. Nope, I’ll be in Chicago, but thanks for the offer. Have fun!